Stems: Plants from knobby rhizomes. Stems erect, simple, retrorsely pubescent. Leaves: Basal and cauline, simple, petiolate, 4 to 8.6 inches long, 3 to 5.5 inches wide; blade depressed-ovate to round in outline, margins deeply palmately divided into 5 to 7 segments, each segment coarsely toothed or cut. Flowers: Sepals 5, distinct, ovate to lanceolate-ovate, .28 to .48 inch, apex subulate; petals 5, distinct, lavender or rose-purple, obovate, .48 to .7 inch, apex truncate to obtuse; stamens 10; styles 5, fused below, forming stylar column .8 to 1.2 inch; stigmas 5. Fruits: Schizocarps, fusiform, separating at maturity into 5 sections, carpel beak coiled outward when dry, 1 seed per carpel; seeds brown, ellipsoid to ovoid, .12 to .16 inch, spreading- or appressed-hirsute. 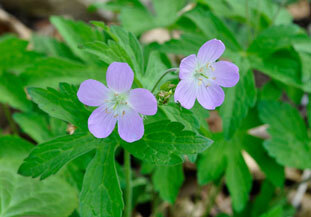 Uses: Spotted geranium was used by many eastern Native American tribes to treat a wide range of medical conditions including treatment of open wounds and canker sores. An infusion of roots was taken for diarrhea and toothaches and a decoction of roots for heart conditions and venereal disease. Comments: Geranium, crane, alluding to the long fruit, and maculatum, spotted.